The National Maritime Museum is a place I visit every month. 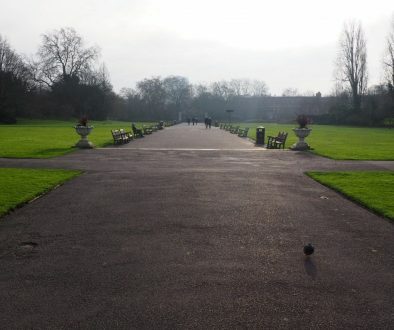 It is the venue for the lectures of the Greenwich Flamsteed Astronomy Society. 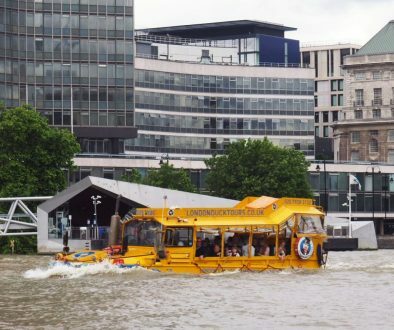 Prior to these lectures, I had visited the National Maritime Museum on one other occasion a couple of years ago. Its expansive space can provide whole days worth of activity. It is the largest museum of its type in the word. 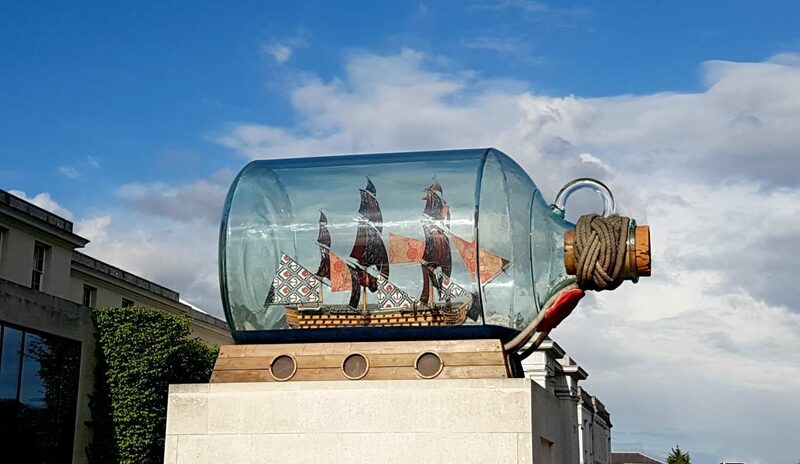 Along with the Queen’s House and Royal Observatory, they tell the story of Britain and the sea, navigation, and the measurement of time and space. The museum holds 2.5 million items, imagine that, of which a small proportion can be shown at any one time. 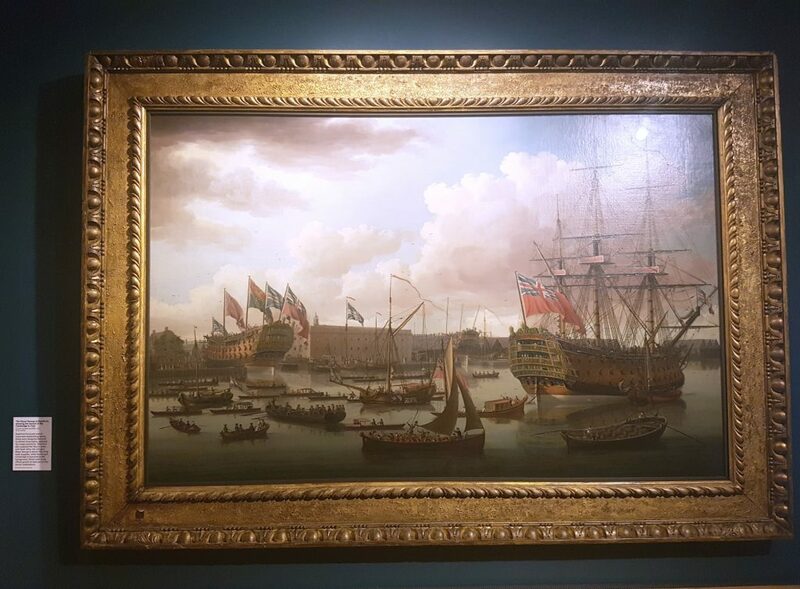 Check out these numbers; there are over 4000 oil paintings, 70,000 prints and drawings, 2,500 models, 3,300 instruments, 50,000 sea charts, 100,000 books, 1 million photographs, 750,000 ship plans and 25,000 antiquities. Wow, I thought I had a lot of stuff in my storage cupboard! The museum has 4 floors, including a lower level exhibition space. Different wings to the east, west and south contain children’s activity area, lecture and learning spaces and cafe. On the ground floor in the centre are the 3 temporary exhibitions areas. It’s difficult to know where to start looking, as there is no natural starting point. This was a good thing because it gave me the freedom to structure my visit in the way I want. So let me tell you about the areas I visited. 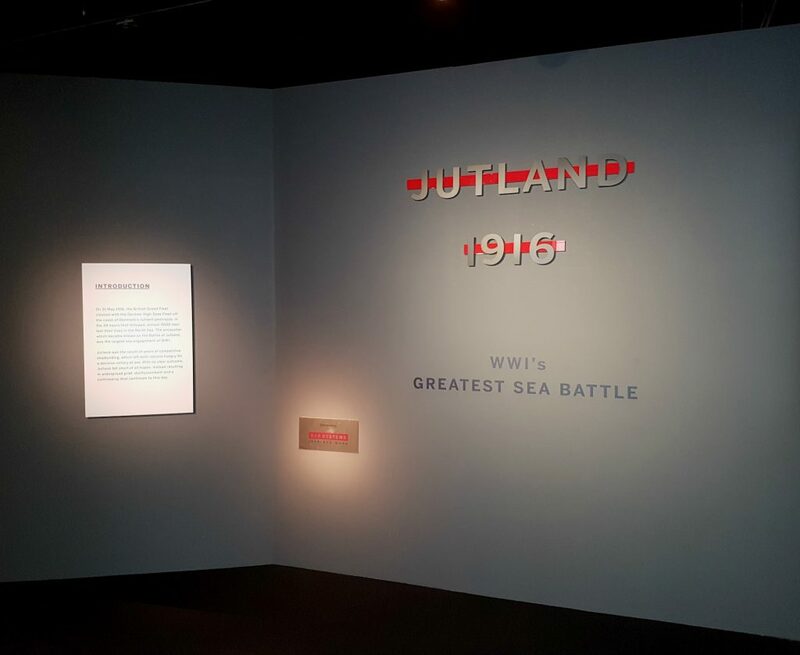 I was completely fascinated with learning about the Battle of Jutland when I entered the area. On display were propaganda posters about the British Navy and resulting aftermath of the battle. Wonderful large, vivid paintings showed the devastation of the battle and remembrance of those lost. What I found totally engaging was a 10-15minute video narrating the events of the battle. The narration was rather quick, so there was quite a pace to the video but it did show diagrams of the tactics deployed. You had to focus and pay attention otherwise you would loose track where you were in the battle. 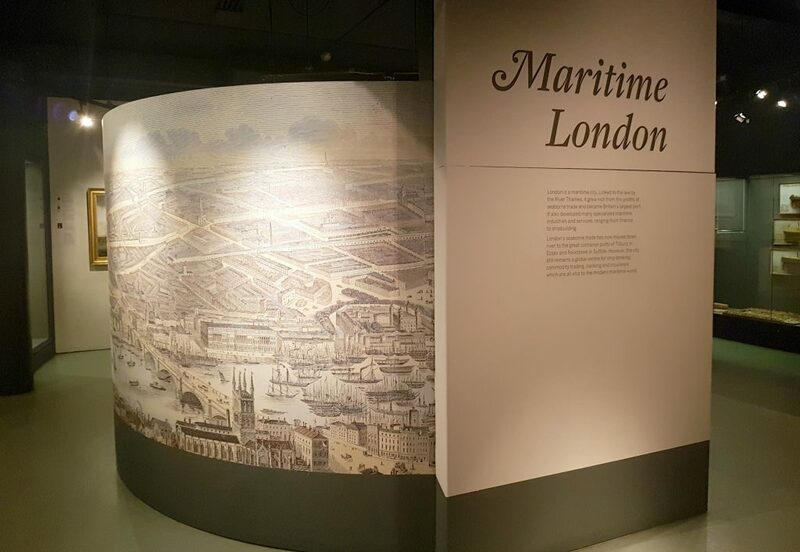 This small space showed the importance of London as a maritime city. There were a number of paintings and models on display describing ships and shipbuilding and cargoes and commerce. 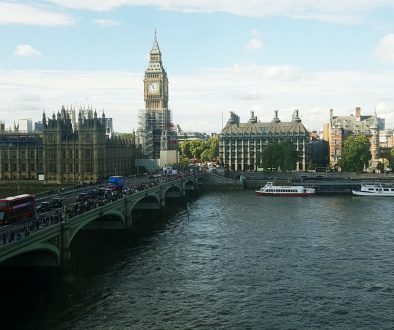 At the centre of this space was a panoramic illustration from 1845 of a view from Vauxhall Bridge to Greenwich as seen from the south bank of the river. Little pointers picked out some of the London landmarks with facts. It was a really good illustration of London. 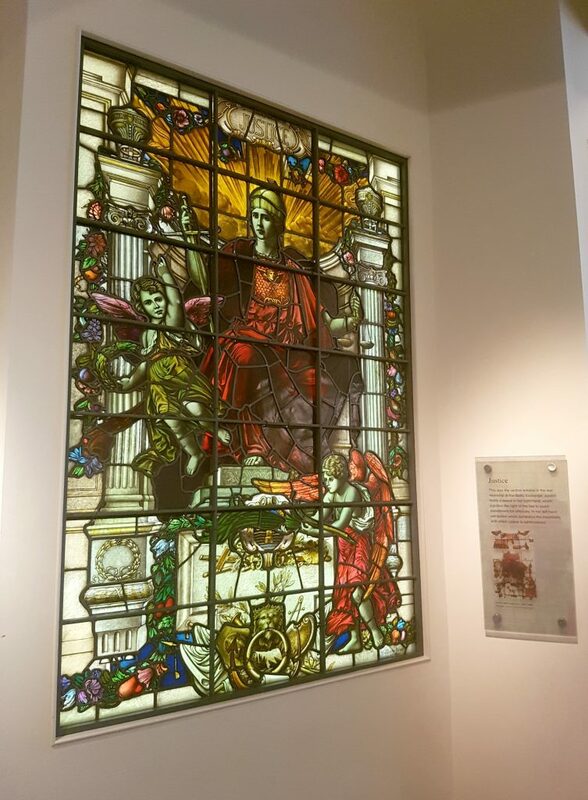 Walking up the south-east staircase to the first floor I saw the Stained glass from the Baltic exchange. The stained glass consisted of a half-dome with five glass windows underneath. 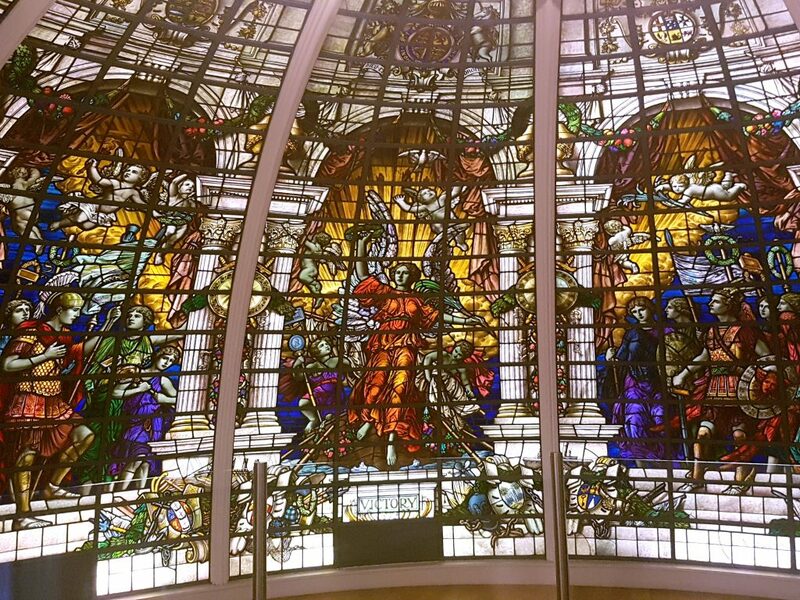 The windows, commissioned to the artist John Dudley Forsyth, were part of a memorial to the 60 members of the Exchange who lost their lives during World War One. The glass designs were beautifully vivid and were a fusion of classical and religious symbolism. The windows depicted the Virtues of Hope, Fortitude, Justice, Truth and Faith. On the second floor is a large area dedicated to life on a warship and that of Horatio Nelson. 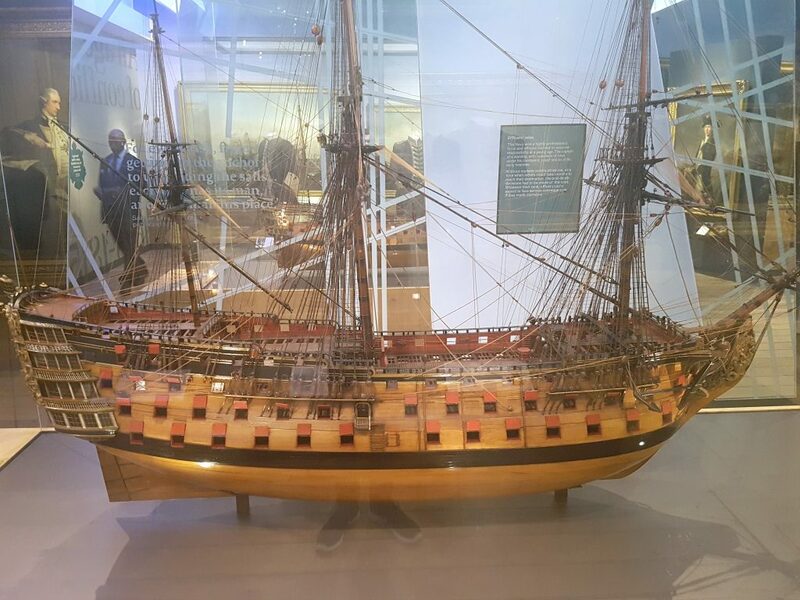 There were lovely ship models on display alongside clothing of what people would have worn at the time. 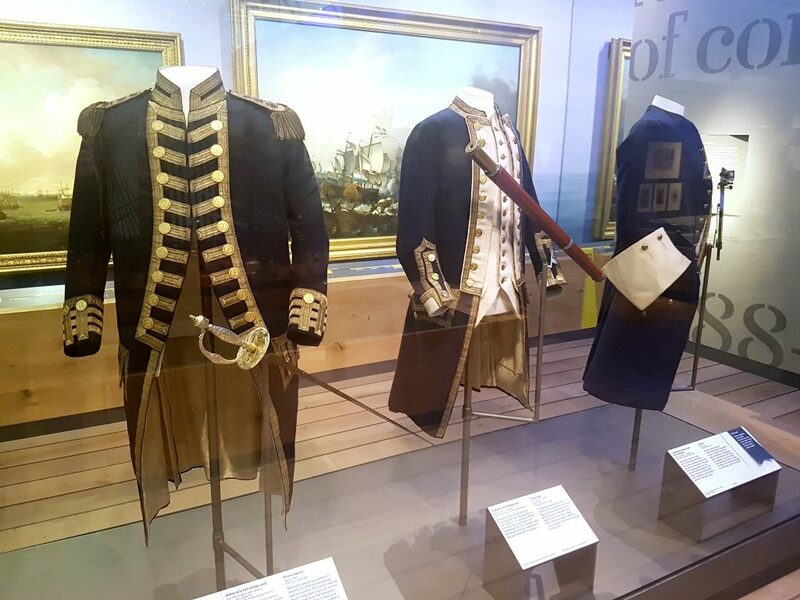 There were poignant sections about the death of Horatio Nelson, including the garments that Nelson wore at the time of his death. A very interesting area if you are into your navy sail. In the centre of the first floor is a giant world map on the floor. When I say giant I mean giant. It is a very popular attraction for kids. This area on the first floor described the journey and impact the East India Company had of the world from beginnings in 1600. As you can see there is so much to see and learn. There are other areas I could have mentioned but I want to make sure this post does not go on for too long. 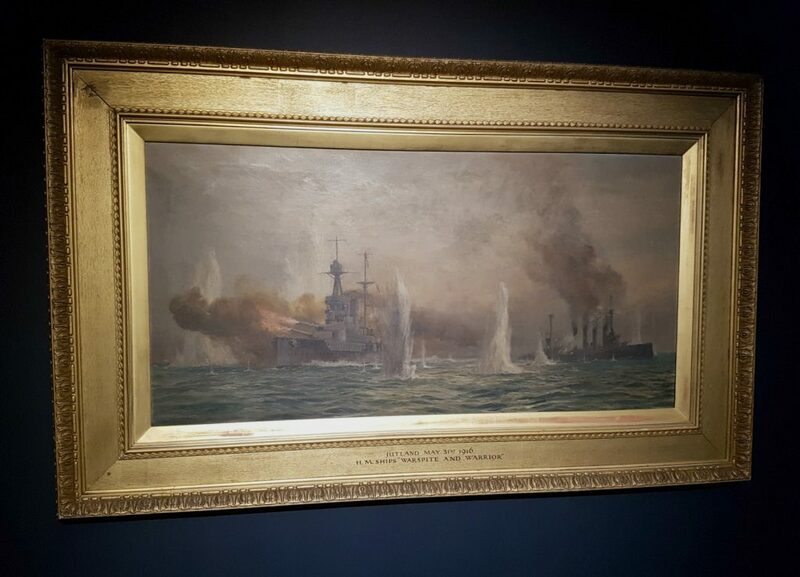 The Battle of Jutland exhibition was what I found most interesting because it really engaged me and taught me something. I loved the Nelson Navy Nation section because I do like to learn about navy sail. 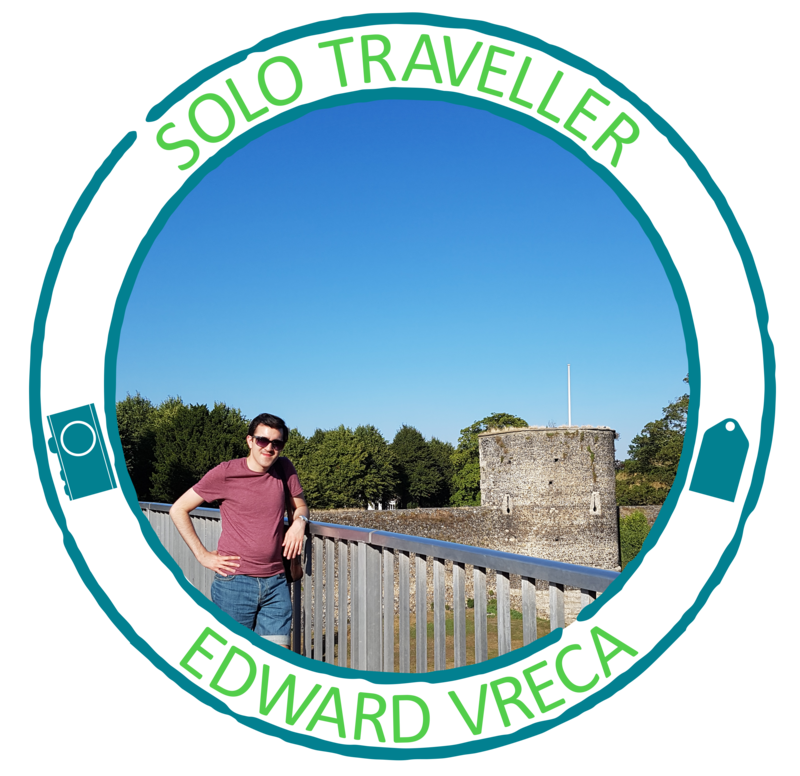 What is great is that all the places I have mentioned are free to view. The only exhibition to pay for is the temporary one on the lower floor. The National Maritime Museum is a very popular place and I can totally see why. 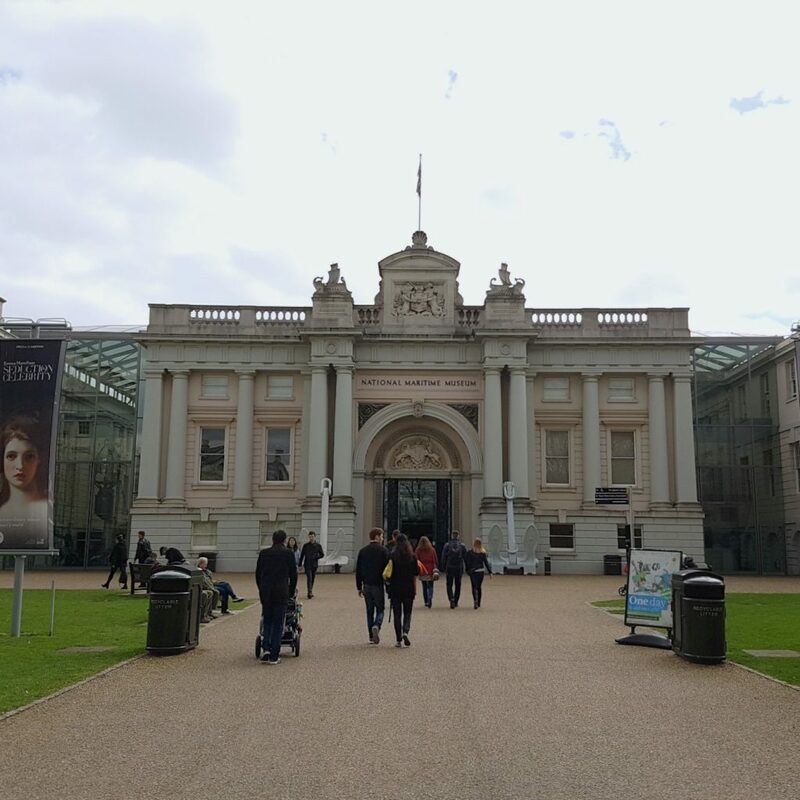 Have you been to the National Maritime Museum? Did you enjoy the museum? Do you like learning about naval history?